Here’s an example on what we could have achieved with total returns of 10% per year if we had saved and invested the full TFSA contribution amount at the start of each year since the TFSA became available. You’re seeing it right. By 2019 (the 11th year), we achieved a TFSA with more than $100,000 without taking on excessive risk. You’ll notice that in the above example, about 60% of the +$100,000 came from savings. That’s because the later contributions, say, from 2016 and onwards, didn’t get much time to compound. In fact, I made it so that the 10% return is compounded at the end of each year. That is, the 10% growth is applied at the end of every year. So, we assume the $6,000 contribution in 2019 hasn’t generated any returns yet, for example. We’re playing defensive as we’re late in a bull market, so if we were starting a TFSA today, we would consider stocks that offer safe dividend yields of about 3-5% and are growing at stable rates that should lead to long-term total returns of 10% or higher per year. Ideally, you would buy these stocks when the market dips, such as the dip we experienced from October to December in 2018. However, despite the recent run-up, the following stocks are still decently valued. 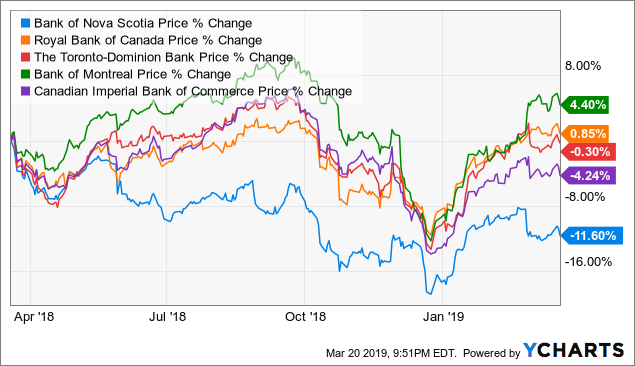 As the graph above shows, Bank of Nova Scotia (TSX:BNS)(NYSE:BNS) or Scotiabank has underperformed its big-bank peers in the last 12 months. This has pushed down its price-to-earnings ratio (P/E) to about 10.4 and lifted its dividend yield to about 4.7%. The international bank generates about 50% of earnings in Canada and about 21% in higher-growth and under-banked markets in the Pacific Alliance countries. It’s estimated to grow earnings per share at a stable rate of about 6% over the next few years. This means that Scotiabank is projected to deliver +10% per year of total returns over the next few years. The rough estimation is calculated by the sum of the current yield and the growth rate (4.7% + 6% = 10.7%). If we account for the fact that the stock is discounted from its normal P/E, Scotiabank stock can actually deliver up to 13.4% per year over the next five years. Scotiabank’s dividend is safe. It has paid a dividend since the bank was founded in 1832 and increased its dividend in the last 43 out of 45 years. Its payout ratio will be about 50% this year. The ratio aligns with those of the other big banks. So, there’s sufficient margin of safety for the dividend even if we do experience economic turmoil down the road. Enbridge (TSX:ENB)(NYSE:ENB) is also another good-valued dividend stock. It’s the largest energy company on the TSX index. Enbridge primarily transports and distributes oil or gas in North America. So, its cash flow generation is stable and strong. In 2018, it generated $10.5 billion of operating cash flow. It used about 65% of it as maintenance and growth capital to reinvest back into the business. Its interest coverage ratio was about 2.56 for the year, which aligned with TransCanada’s (TSX:TRP)(NYSE:TRP) ratio of 2.5. Enbridge has increased dividends for 23 consecutive years. Its 3-year dividend growth rate is 13%. It plans to hike its dividend by 10% next year. After that, management already anticipates distributable cash flow to grow at about 5-7%. So, the dividend growth from 2021 will likely be within that range as well. Thankfully, the stock offers a yield of 6% right now. So, we really only need a 4% growth rate to get the targeted 10% rate of return. Enbridge pays out about 65% of distributable cash flow as dividends, which leaves a margin of safety for its dividend. To get to a $100,000 TFSA, save and invest regularly. Make full contributions to your TFSA every year, invest in good-valued dividend-growth stocks with yields of 3-5%, and aim for that +10% rate of return. Currently, we think Scotiabank and Enbridge have what it takes to generate long-term returns of 10% per year. Here are some useful tips to improve your success in stock investing. Disclosure: As of writing, I’m long TD, BNS, ENB, and TRP.